Ata Rangi is owned and run by Clive Paton and his wife Phyll, together with Clive's sister Alison and winemaker Helen Masters. Clive planted the bare, stony home paddock at the edge of Martinborough in 1980 and, in doing so, was one of a handful of people who pioneered grape growing in the area. Ata Rangi's first vineyard covered less than five hectares of thin, well-drained alluvial soil. They are now, according to UK winewriter Tim Atkin, widely regarded as New Zealand's top Pinot Noir producer. Ata Rangi was recently given the title of Tipuranga Teitei o Aotearoa which translates from Maori as Great Growth of New Zealand or Grand Cru at the International Pinot Noir 2010 Conference. In presenting this inaugural award, Alastair Maling, MW and Chairman of Pinot Noir 2010, said: - The Tipuranga Teitei o Aotearoa award recognises those who have taken time and shown skill and commitment in evolving and developing New Zealand Pinot Noir. 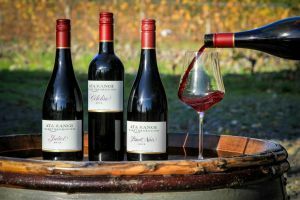 Ata Rangi is widely considered to be a Premier Producer of Pinot Noir; the top echelon and an inspiration to the rest of the industry. This award is a uniquely New Zealand one, combining terroir with winemaking philosophy and consistent quality. It can only be achieved with vine age, proven wine quality, authenticity and undoubted global recognition. ?